Philosopher and theologian; born in Cusa, or Kues, on the Moselle, 1401; died in Todi, Umbria, 1464. He was Bishop and Cardinal of Brixan (Tyrol) at his death. As theologian he was known for his liberal views and wide mental horizon. It was he who facilitated the transition from the scholasticism of the Middle Ages to the philosophic speculations of the Renaissance. Cusa came in contact with the Jews both as a papal legate and as a philosopher. As legate he issued, with the approval of the Synod of Bamberg, an ordinance prescribing the badge for all Jews and Jewesses of Bamberg, and forbidding usury. Contravention of these laws would entail the ban (April 30, 1451). Through the intervention of the Roman emperor Frederick III. this ordinance was not immediately carried out. In 1452 De Cusa was compelled by the emperor to extend the term in regard to the Jews of Nuremberg, and on May 1, 1452, the pope (Nicolas V.) excluded Nuremberg entirely from the provisions of the ordinance. On March 20, 1453, on the representation of the Bishop of Bamberg, his diocese was also exempted; and on Oct. 15, in consequence of a petition of the Archbishop of Salzburg, the ordinance was made inapplicable to the whole of the Salzburg bishopric (see Stern, "Urkundliche Beiträge," i. 47, 52, 53, 55, 57). As philosopher, De Cusa showed a much more impartial spirit in his attitude toward the Jews. He leaned toward the views of the German mystics. He refers to the book Raziel, without, however, evincing a thorough acquaintance with the Jewish mystics. 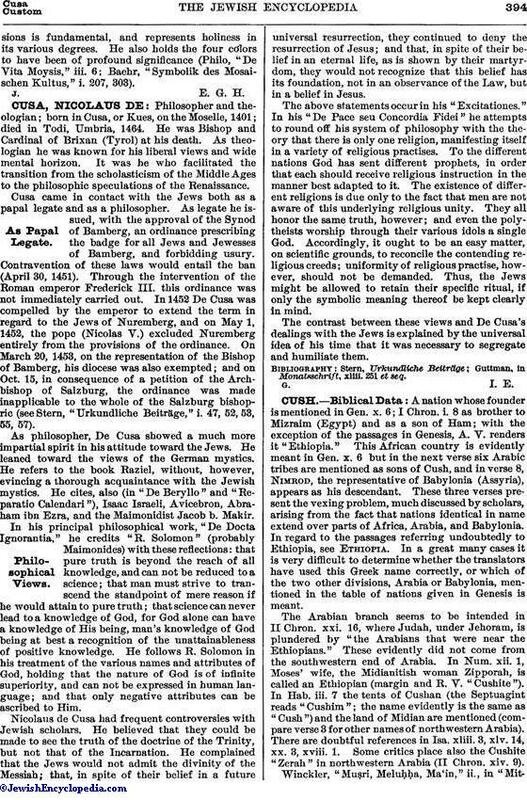 He cites, also (in "De Beryllo" and "Reparatio Calendari"), Isaac Israeli, Avicebron, Abraham ibn Ezra, and the Maimonidist Jacob b. Makir. In his principal philosophical work, "De Docta Ignorantia," he credits "R. Solomon" (probably Maimonides) with these reflections: that pure truth is beyond the reach of all knowledge, and can not be reduced to a science; that man must strive to transcend the standpoint of mere reason if he would attain to pure truth; that science can never lead to a knowledge of God, for God alone can have a knowledge of His being, man's knowledge of God being at best a recognition of the unattainableness of positive knowledge. He follows R. Solomon in his treatment of the various names and attributes of God, holding that the nature of God is of infinite superiority, and can not be expressed in human language; and that only negative attributes can be ascribed to Him. Nicolaus de Cusa had frequent controversies with Jewish scholars. He believed that they could be made to see the truth of the doctrine of the Trinity, but not that of the Incarnation. He complained that the Jews would not admit the divinity of the Messiah; that, in spite of their belief in a future universal resurrection, they continued to deny the resurrection of Jesus; and that, in spite of their belief in an eternal life, as is shown by their martyrdom, they would not recognize that this belief has its foundation, not in an observance of the Law, but in a belief in Jesus. The above statements occur in his "Excitationes." In his "De Pace seu Concordia Fidei" he attempts to round off his system of philosophy with the theory that there is only one religion, manifesting itself in a variety of religious practises. To the different nations God has sent different prophets, in order that each should receive religious instruction in the manner best adapted to it. The existence of different religions is due only to the fact that men are not aware of this underlying religious unity. They all honor the same truth, however; and even the polytheists worship through their various idols a single God. Accordingly, it ought to be an easy matter, on scientific grounds, to reconcile the contending religious creeds; uniformity of religious practise, however, should not be demanded. Thus, the Jews might be allowed to retain their specific ritual, if only the symbolic meaning thereof be kept clearly in mind. The contrast between these views and De Cusa's dealings with the Jews is explained by the universal idea of his time that it was necessary to segregate and humiliate them. Guttman, in Monatsschrift, xliii. 251 et seq.